As you know, perfume is mostly composed of alcohol. Did you hear that perfume companies are going to begin marketing alcoholic beverages? The first will be called "Estée Lager." Recording artist Ken Clinger's rendition of the One-Letter Words theme song has made another appearance, this time on an album entitled "Cassette Culture Compilation 2." The album (released by Harsh Reality Music) features new tracks by 28 artists from the U.S. and Europe who first emerged as part of the international cassette-culture scene (1978-1990). Gossip A: The way I hear it, Dante and Virgil say Phlegyas the ferryman isn't all he's cracked up to be. They say he's from the Boondocks. Gossip B: No, no—he's from out in the Styx. A scene from the The Divine Comedy: Dante and Virgil carried by Phlegyas on his boat. From a stained glass window (19th century) in the Poldi Pezzoli Museum in Milan, Italy. Courtesy of Wikimedia Commons. Most people tried the oldest trick in the book, carrying a small amount of money in an obvious place and hiding the rest in a less obvious place. Did you know that L. Frank Baum considered Little Boy Blue to be genuinely overworked? Collage source material: Top, from Mister Blue: Memoirs Of A Renegade by Edward Bunker. Bottom left, a hand-colored stencil by James Napoli. Bottom right, an altered street sign. Can you guess this cartoon's caption? Highlight this black bar to reveal answer: A tough nut to crack..
One 7-letter word is a night-blooming flower. Another is a threadlike appendage. Still another refers to a gang of outlaws. 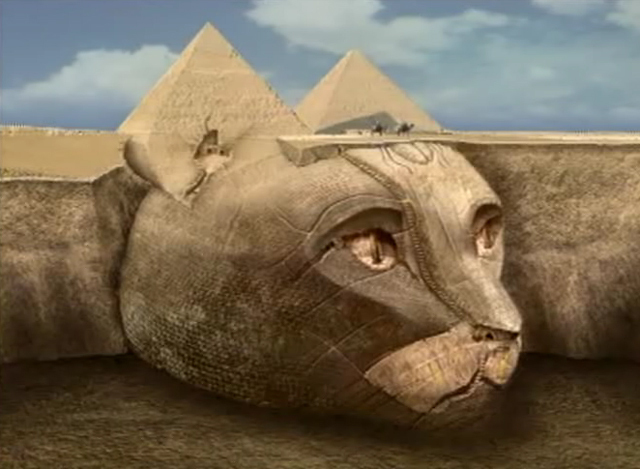 I've always suspected that archaeologists have yet to discover the full extent of the ancient Egyptian cat goddess (see below). The oldest trick in the book is for the rootkit to obscure its own location on the disk. "What does it take to make you happy?" For starters, two-weeks on the unspoiled coastline of Bermuda. That is the oldest trick in the book. Now you see it — now you don’t. In a universe defined by a spreadsheet, intangibles don’t exist. 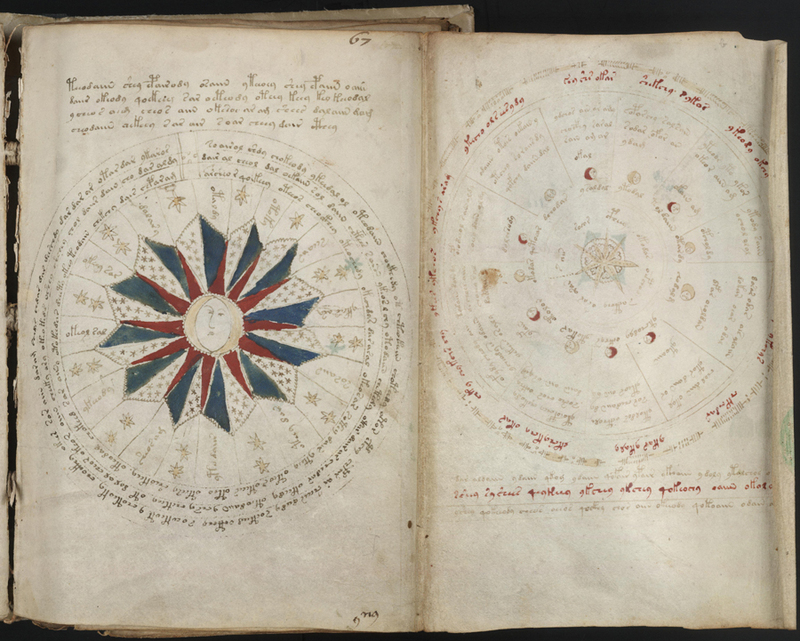 The Voynich Manuscript is "a mysterious illustrated book with incomprehensible contents. It is thought to have been written between approximately 1450 and 1520 by an unknown author in an unidentified script and unintelligible language" (Wikipedia). Every few years, another scientist holds a press conference to declare the book a "hoax." The book (see high-resolution scans on flickr) is undoubtably an historical document, an artwork, and an insight into psychology (as the creator's brainstorm). To call it a "hoax" seems so dismissive. Indeed, it's like missing the forest for the trees. 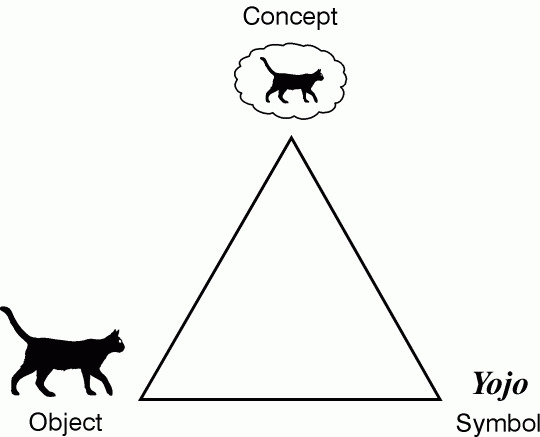 Whether or not the document encodes specific meaning, it exists and has significance. One is reminded of ancient petroglyphs, which could be a form of writing, or merely whimsical doodles/graffiti, but certainly "meaningful" and worthy of study (or at least appreciation). I'm all for computer scientists and cryptographers, but these so-called explanations of the Voynich Manuscript tell more about the tunnel vision of those fields than they do about the manuscript itself. And I thought only statisticians still cited statistical probabilities with a straight face, everyone else in the world having realized that statistics are, unfortunately, as useless as tomorrow's weather forecast! Did you hear about the funnel cake ad campaign involving the Tin Man from Oz? It was foiled. I was in a public building, and a stranger asked if I knew what time it was. "I think it's about 2:00," I said, "but I can give you a better answer in a second." I fished my watch out of my pocket, and then informed her that "It's 2:00." The Follow Your Bliss Compass is located here. While shopping, I was contemplating on making a large furniture purchase. Undecided, I kept finding reasons not to spend the money. The clerk then said to me "Before you purchase, follow your bliss." What?? How about room theme or color scheme, but bliss? What does bliss have to do with my purchase decision? 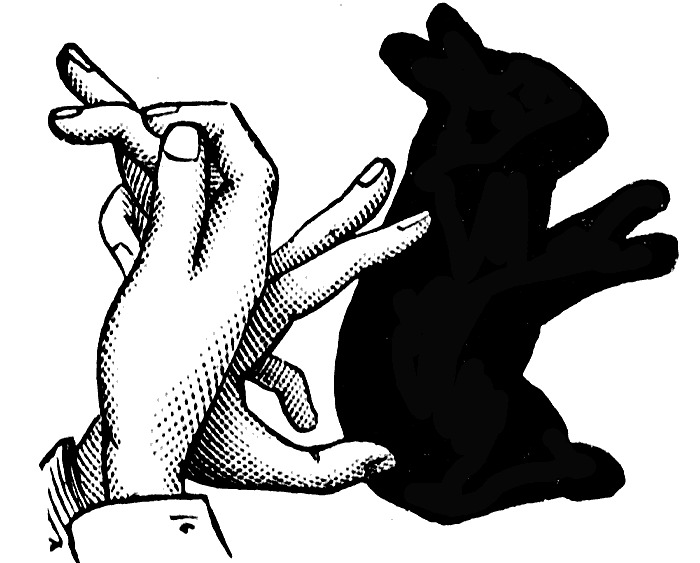 Do you ever have the sense of being helped by hidden hands? Today I did... I need to go out and do what makes me come alive. I need to tap into the energy that makes me tick. Bliss comes from within, not from striving for outer appearances or outer circumstances. Living my own unique life in harmony with myself (and my son)... Now, that's bliss. I found this website (www.oneletterwords.com/bliss) and may spin the wheel on a daily basis. Maybe, just maybe, this will help to keep me on the right track. My "Follow Your Bliss Compass" suggested that it is 'Time for some quiet contemplation'. The comment from the clerk and this compass have already made an empowering change in my life. One 7-letter word means "a stretch of land." Written language captures things that spoken language never could. Does anyone know, for example, what a semicolon sounds like? Consider the sentence "Order your furniture on Monday, take it home on Tuesday." With a comma, it means that if you order your furniture on Monday, you can take it home on Tuesday. "Order your furniture on Monday; take it home on Tuesday" is different, however; it is a double command. But sometimes you can't tell the difference between the two sentences simply by hearing them read aloud. You need to see their punctuation to detect the difference. If you look carefully, Mr. [Geoff] Nunberg said, the world of punctuation has its own rules of power politics. Commas are the weakest, semicolons are middleweight powers and colons are superpowers. Look more carefully and there is even a ranking among semicolons. When spoken, the word "silence" contradicts its meaning. 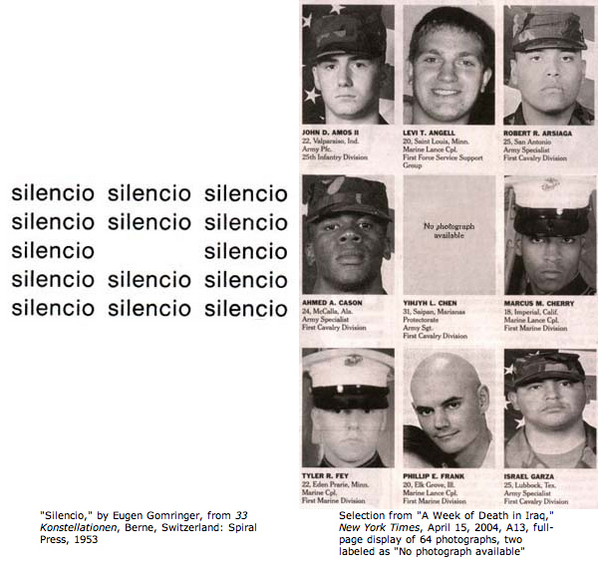 Gomringer's concrete poem [below left] creates a new and better word for "silence": the void in the middle. That space, that absence, is now filled with an eloquent presence. So then what is the better representation of a dead person, a photograph displayed or no photograph available? The full size of this illustration is here. 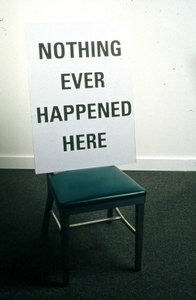 "Nothing Ever Happened Here," 2002. Paper, ink, stainless steel, and vinyl. The oldest trick in the world is to put the word “new.” I mean nothing is older than the idea of the new. I came across a reference to the film "I Escaped from the Gestapo" (1943), but I somehow misread the last word as "Geppetto" and thought the film was about Pinocchio running away from home. I dreamed I screamed hesitation! Bodhisattva dancers. Photo from nmazca.blog. In Japan, most statues of Thousand-Armed Kannon, a Buddhist Goddess of Mercy, show only 42 arms. Two are normal arms, and the remaining arms each represent the 25 Buddhist worlds. 40 times 25 equals 1000, plus two regular arms equals 1002. Whether a statue has 42 arms or 1002, it still seems to misrepresent the goddess by minimizing or exaggerating her arms! Tibetan art seems to have a better grip on one thousand arms. This painting of Thousand-Armed Chenrezig (a.k.a. 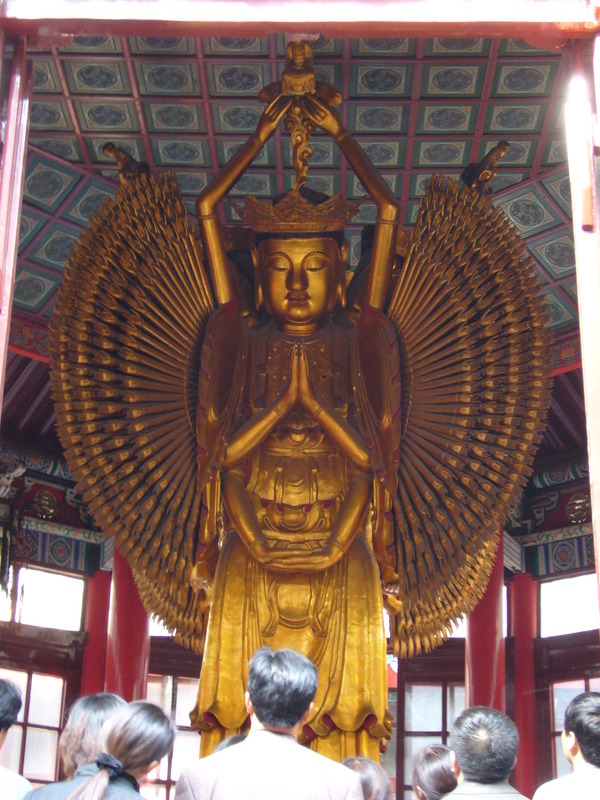 Avalokitesvara, the Buddha of Compassion) looks convincing. This Chinese statue of the Goddess of Mercy also appears to get the number right. The oldest trick in the world is to give someone a fancy new title instead of a raise. One 8-letter words describes someone who is unusually enthusiastic about saving the environment. Ma: Tsk, tsk. Have you seen this new governmental program? "Accent on Education" they call it. It's unspeakable! Was New Orleans devastated by Hurricane Katrina? With "hindpsych," the unfortunate answer is "yes"! Note that every card in our Tarot spread features wands. The hermit (left) holds a wooden staff for support. The central figure struggles to carry a bundle of sticks (still in leaf, as if fallen branches from living trees or uprooted trunks). And the Page of Wands (right) seems to be planting a tree in a barren landscape. We begin with the center card, the Ten of Wands, as it is flanked by two figures facing away from it. The central figure is saddled with a difficult burden. He is carrying a heavy load, perhaps laboring to clean up a messy situation. (Ultimately, he is headed toward the right, where the Page of Wands is planting a tree, so the heavy load in the center picture is more likely saplings, symbolizing the labor and promise of regrowth.) We see a house and trees in the background; we can easily conclude that the landscape refers to storm-damaged New Orleans and that a time of struggle is looming. The two figures facing away from the center card represent two outcomes. 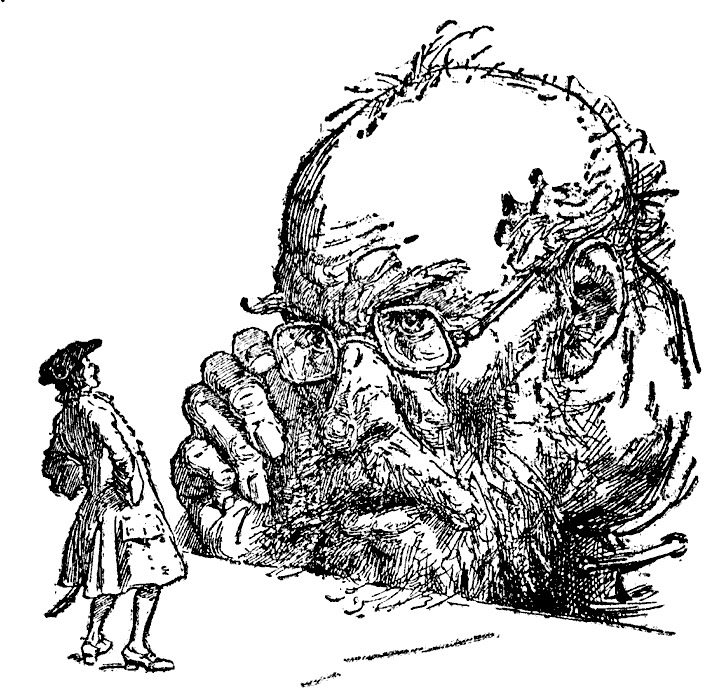 On the left, the Hermit represents receiving guidance and accepting help. 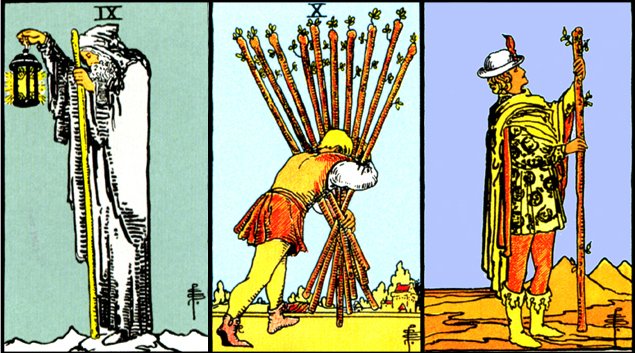 On the right, the Page of Wands symbolizes creatively and wholeheartedly tackling a challenge. Our spread indicates that New Orleans will experience a "dark night of the soul" (the Hermit) but will blossom again through assertive action (the Page of Wands). We can say with confidence that New Orleans was ravaged by Hurricane Katrina, and we can now move on. Tarot cards hand-colored by Prof. Oddfellow from Public Domain artwork. Create a personalized certificate here. My friend Jonathan wrote to me about "making pesto like an Italian grandmother." I got to thinking that fresh basil and extra virgin olive oil aren't enough, in and of themselves, to make pesto on par with an Italian grandmother's. It occurred to me that in order to make pesto like a real Italian grandmother, one would have to somehow be an Italian grandmother. Improbable, perhaps ... but not impossible, thanks to the Honorary Italian Grandmother (and Saint) Certificate. I created the Honorary Italian Grandmother (and Saint) Certificate for those rare individuals with a flair for maintaining tradition, improvising without blinking, and turning anything into a nurturing experience. The Certificate is personalized in fine calligraphy, easy for you to generate, and completely free! Click here to check it out. The oldest trick in the book is to pass a competitor looking as strong as possible, even if you can only keep it up until you’re out of view. Today's "symbolic outlook" from MysteryArts.com is rather exciting. Notice the elegant progression of spirals, from a tiny spiraling line within the crystal-ball (left), to the full spiral in the circle (middle), to the uncoiling spirals forming the magic lamp (right). The small spiral is but one of many things floating inside the crystal ball. Whether symbolizing a spiritual journey, evolution, growth, or the balance of light and dark (as in ancient Chinese art), the outlook seems to suggest that focusing on the spiral brings it to the foreground and enlarges it. Then, in the third panel, the spiral doubles itself to cradle the flame of a genii's lamp. Therefore, looking inward (the crystal ball) provides insights into nurturing the spark of life (the spirit contained within the physical shell of the lamp). Even better are the captions for each symbol. Reading left to right, enchantment (finding delight, being charming), if put into motion (acted upon), will fuel the imagination (make-believe, as in the Aladdin story). One 7-letter word refers to a divine or prophetic token. This exquisite line from Tim Powers' novel The Anubis Gate inspired my collage. "What do you expect?" Only the very best. I'm as old as my bubble gum and a little older than my tooth decay. In the middle of the night, I woke up briefly with a dream idea I was determined to remember in the morning. It had something to do with the words zither, blither, wither, and slither, and how they could all be represented by a single picture (like a political cartoon). I recall that the image would have been ring-shaped, to suggest zithering, blithering, withering, and slithering. As with too many dream images, the details had faded by the time I got out of bed. I'm left wondering what the image would have looked like. Could it have been a droopy fool (a withered, blithering idiot) playing a zither in the shape of an Ouroboros (the snake slithering into a ring)? As a bonus, the entire image could be dithered! Oldest trick in the book, gentlemen. You take your weakest grunt, you pair him with your strongest, then you give ’em mutual goals to motivate ’em. From Gulliver's Travels by Jonathan Swift. Each one of the pictures below is entitled "Unknown Fisherman." Is an Unknown Fisherman some sort of archetypal figure? He is symbolic by his very nature, for we know nothing about him. What does his appearance suggest? Is he a manifestation of the Fisher King of Arthurian legend? And/or a Christ figure? Does he hold the Salmon of Wisdom from Irish mythology? Here's an anecdote by a person who carried an Atlantic salmon fly from one corner of Europe to the other, with the sole purpose of giving it to an unknown fisherman. The quest sounds like some sort of pilgrimage, and the gift sounds like a tribute to a deity. Top left, The Unknown Fisherman. Top right, the Unknown Fisherman who caught a 22lb4oz hatchery steelhead on the Wynooche in the winter of 2002. 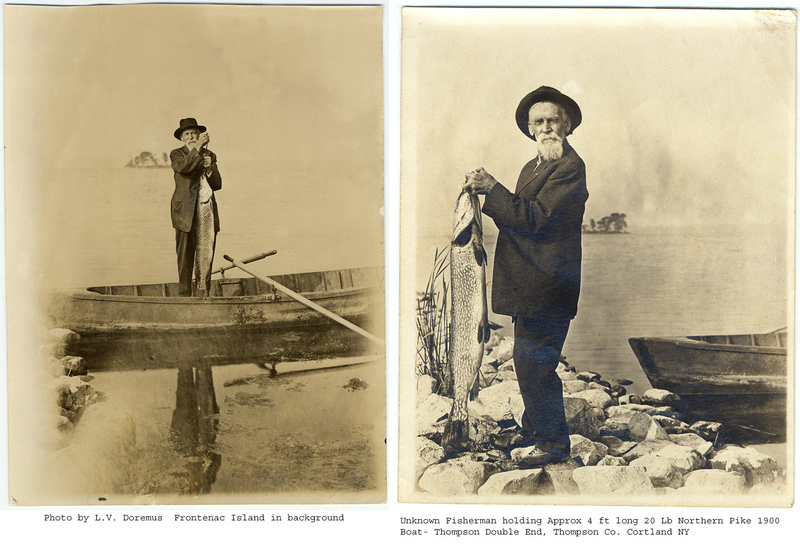 Bottom left, an Unknown Fisherman holding a 4-foot long 20 Lb Northern Pike in the year 1900. 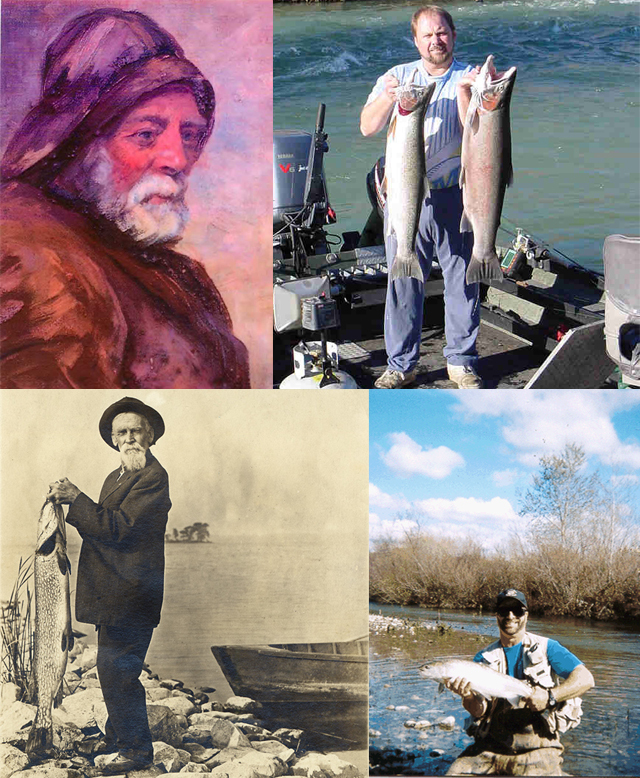 Bottom right, an Unknown Fisherman circa 2000-2001, participating in the Carmel River Steelhead Catch and Release Program. The market for food books appears, at last, to have begun devouring itself. Nearly every topic worth writing about has been written about, and the well of reliable, interesting information on food, once thought inexhaustible, is beginning to run dry. In circumstances such as these, author Barry Foy believes that an honorable writer has nowhere to go but sideways, into the realm of lies, misleading claims, and baseless speculation. With its hundreds of entries on subjects ranging from ingredients to utensils to techniques, plus its you-are-there historical coverage of everything from the little-known Icelandic roots of cheese to the strange case of Emil the Talking Black-Eyed Pea, The Devil's Food Dictionary promises much-needed relief to the foodish reader who finds him/herself sagging under the burden of informativeness and credibility. smorgasbord also smörgasbord; smorgäsbord; smorgasbörd; smörgasbörd; smörgäsbord; smorgäsbörd; smörgäsbörd; smörgäsbörrd: A lavish Swedish buffet traditionally consisting of four courses plus dessert. The first course is always herring, the undisputed king of Scandinavian foods. This can include pickled, smoked, and/or fried herring, as well as pickled smoked herring, pickled fried herring, and fried smoked herring. The second course moves on to other types of seafood, such as salmon in herring sauce, herring-smoked eels, and jellied sprats (a relative of the herring). Third come meats such as veal and beef in various delectable forms, but the unpopularity of those dishes--owing to their lack of herring--usually results in their being donated to Somali refugee centers. The fourth course features traditional hot dishes, such as sprat gratin (herring can be substituted), baked onions stuffed with herring paste, and/or meatballs molded in the shape of a herring (or a sprat). The dessert lineup is enshrined in tradition and unfailingly includes herringberry coffee cake, creamy cheesecake from which all herring (or sprat) bones have been painstakingly removed, and s'mores, the chocolate-marshmallow-graham cracker confection after which the smorgasbord is named. One 7-letter word is a synonym for sailors, and one refers to things that go bump in the night. Q: How do they make rye bread? A: It's grown from caraway seeds. Q: What did an exhausted Santa say to Mrs. Claus after delivering presents to the tropical forest? A: It's a jingle out there.